Headrest mounts are great especially when you opt for a long journey. They are perfect for your car. Everyone wants to load their tab with full of latest games, movies, and TV shows before hitting the road. A tablet headrest mount allows you to do things with ease, be it for watching movies on a long trip, navigating through an adventure via your tabs GPS, or just playing games on the road. 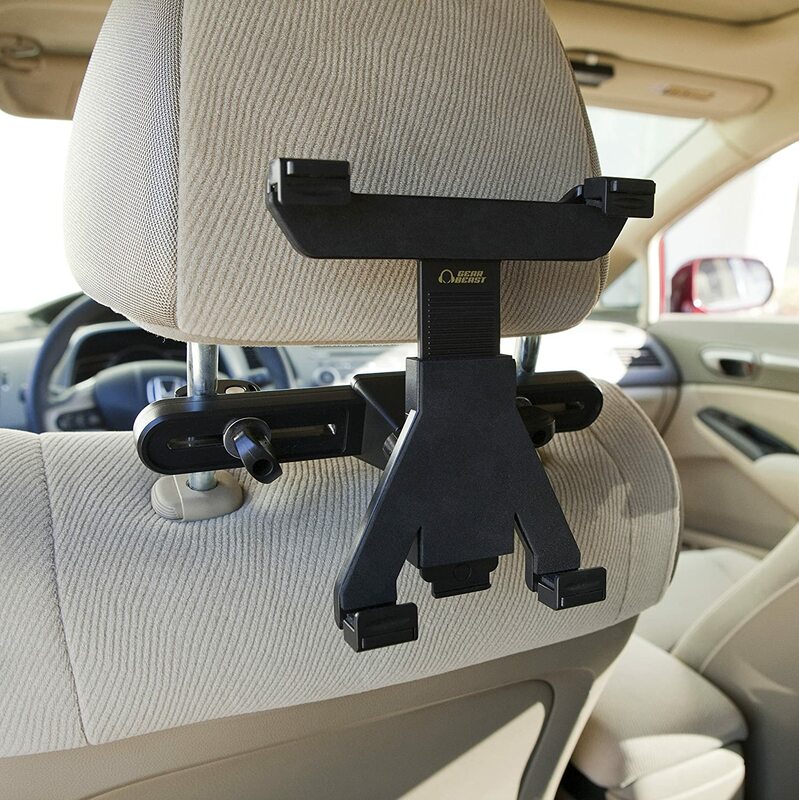 Car headrest mount holder is a handy device that gets easily attach to the back of the seat. As the user, you can simply interact with your tab by just tapping on its various functions. It helps to keep your backseat passengers entertained. It has made family road trips considerably easier and more pleasurable. The headrest mount pushes things up to an important mark by eliminating hand fatigue and rapidly increasing ease of use. So here we look at some of the best headrest tablet mount available in the market for people who regularly move around. TFY headrest mount is for the 7inch tablet. It is very simple and easy to attach. It comes with a universally adjustable strap that allows for quick and secure mounting of the tablet to almost any cars headrest. This tablet can be easily attached and detached to the headrest as many times as u want for your convenience. The position of the tablet can be adjusted in any form as passenger desire either in portrait or landscape mode. The TFY is the best tablet headrest mount as it mounts quite high and gets attached firmly with the back seat of the vehicle keeping it away from young children. It comes with a special and additional feature of expandable Velcro straps that helps in moving the tablet easily between headrests or even between vehicles. Arkon car seat headrest mount is an essential for a road trip. This headrest mount is compatible with large screen size tablets that include Apple, Kindle Fire, Nexus, Sony Xperia, Samsung Galaxy Note and Galaxy Tab pro. It is appropriate for tablet viewing by one back seat passenger. It can be attached to the drivers as well as passengers side seat if the car has two port headrest configurations. 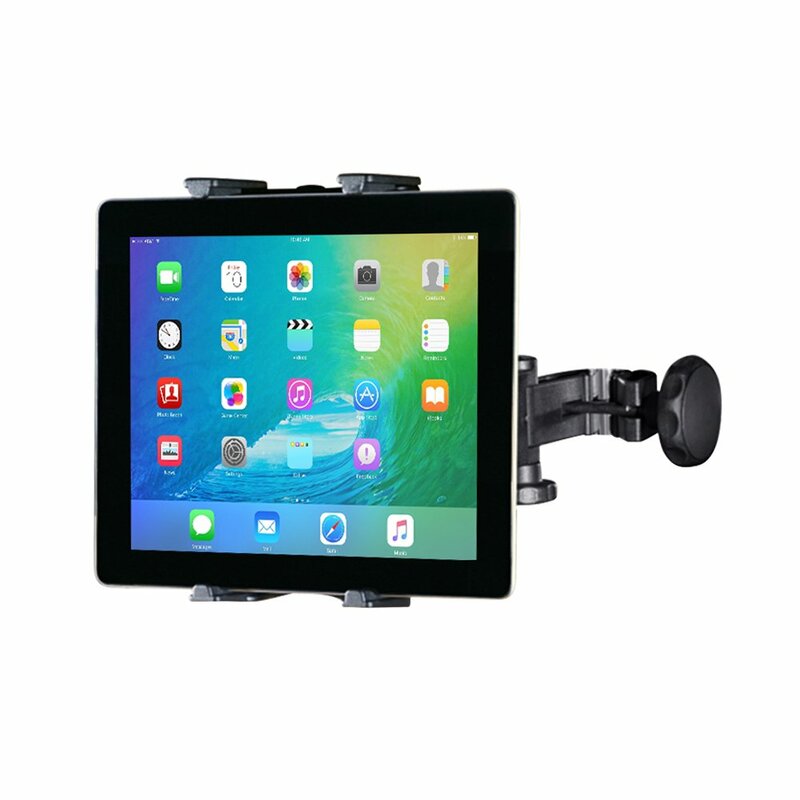 It has a high-quality universal tablet headrest mount that secures any large size tab with the help of the universal spring loaded holder, making it easy to insert and remove the tab with one hand. This headrest mount comes with eight support legs that can be customized with the mount to provide the perfect fit for your tablet. Infernal headrest mount is one of the top rated mounts because of its easy installation. It is designed with the good quality post clamps and metal screws that help in the strong installation within two minutes on headrest poles. Once installed it can be easily attached and detached to get the most out of the device. It has a built-in EVA foam and an extra rubber grip that absorb vibration and cushion your device to prevent any kind of damage. It comes with a durable plastic clamps and metal screws that will keep your tablet safe and secured to the headrest posts. These clamps aren’t a cheap plastic clip that snaps off. This mount is highly adjustable with 360-degree rotation. It can be rotated left and right so that the middle passenger can also view it. iGrip car headrest mount holder is for all Kindle Fire models. 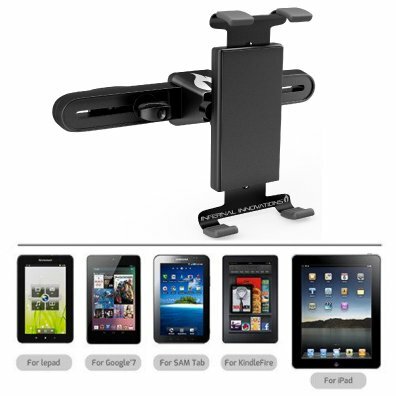 It is a secure headrest mount designed for your Kindle Fire, Kindle Fire HD, or Kindle Fire HD 8.9. This headrest mount can rotate up to 360 degrees and can be adjusted vertically and horizontally as per the need of the viewer. It’s simple placement and removal of the device makes it easy to handle the device with one hand. It comes with a clamp which is completely adjustable and works best with all Kindle Fire models. It consists of foam rubber padded pegs that guarantee protection for the tablet. It is engineered and made in Germany. Gear Beast universal tablet mount is the best tablet headrest mount for 7 to 10.2-inch tablets. The gear beast tablet holder for car headrest can turn your Apple-Tab, Samsung Galaxy Tab, Google Nexus or another tablet into a backseat entertainment system. It is easy to install and this mount features an innovative ball in socket design that can be rotated up to 360 degree and can be tilted up to 45 degrees to create the best viewing angle for rare seat passengers. It comes with metal arms and tightening knob that prevents slipping of larger tablets. In seconds, you can attach it to the driver or passenger side headrest without the use of tools and it will not damage your car’s headrest or interior. It contains cushion that provides grip for a secure hold and prevents shock absorption. Music lovers can easily enjoy the music by mounting the tablet headrest mount and tap to the tunes. Freed yourself with any hassles of holding the tablet at your inconvenience. 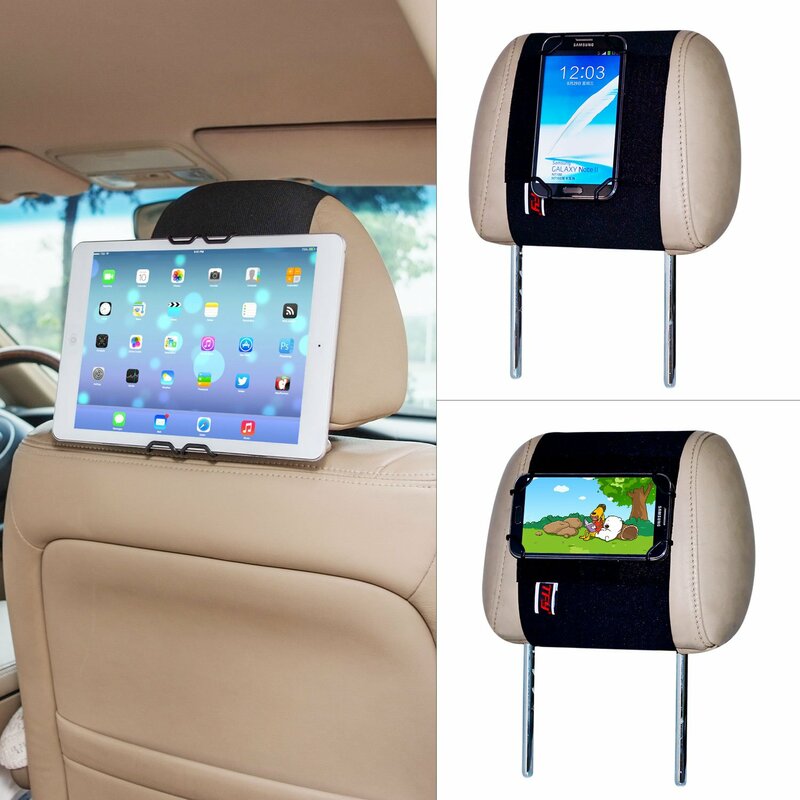 Another feature that attracts the customers are tablet headrest mount. You can keep children entertained by playing a movie for your tab mounted in its place. 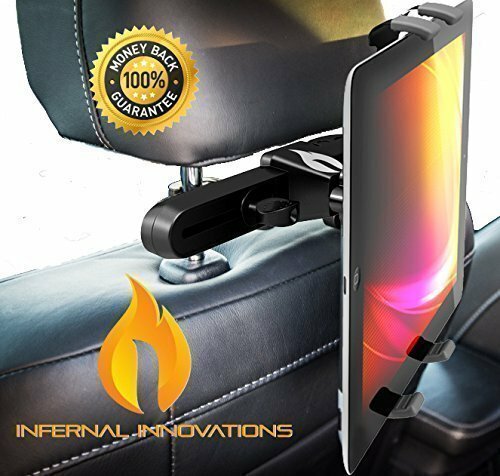 The elevated position makes it easy and flexible phone holder for everyone sitting in a vehicle for viewing a movie. One can easily see their office messages, write and forward important texts, chat with colleagues and can even perform applications from the internet. If you don’t have any movies left to watch, you can simply play the games on your rested tab. Games such as solitaire, tic tac toe, backgammon, snake, and ladder, etc is a great source of entertainment for children. 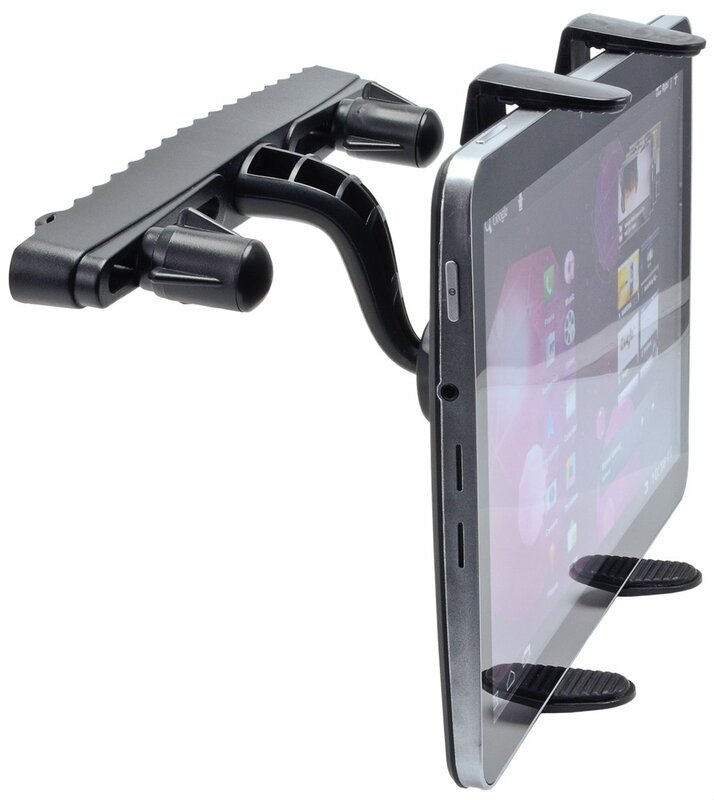 A headrest tablet mount is a great covering for safety as we protect the mobile handsets with cases and covers. These mount come in different colors, shades, styles to meet the modern day man. It is recommended to test drive prior to purchasing. This entry was posted in Headrest.